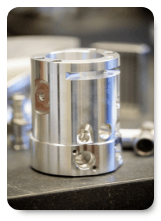 Kovacs Machine & Tool Co. is a preferred, OEM supplier of precision-machined components for some of the industry’s largest customers. We supply parts in nearly every major industrial segment both locally, and, globally. Kovacs Machine & Tool Co. has extensive capabilities to meet the needs of our customers. Our proven approach helps our customers bring their parts from the engineering table to finished products. Efficiency and Innovation are synonymous with the work we do. Kovacs Machine & Tool Co. guarantees that you will be satisfied with our quality, workmanship, delivery, and value. We are able to make this commitment because of the knowledge and experience that we have fostered for over 75 years.